(11-20-2018, 12:01 AM)Darklink Wrote: Hello, I am trying to find the folder where I must put the HD textures in Ubuntu 18.10 and can't seem to find it. Can anyone help? It's not in "Home/Documents". Thanks for the help. There's only one folder there, namely "Profiles". Should I create the folder manually? Not sure what would create a folder called Profiles in there... Are you sure you're not looking in ~/.config/dolphin-emu/Config/? That's the place that usually would contain a folder named Profiles. Nothing exists in the folder but some .inis and the Profile folder. EDIT: Found it under "/home/username/.var/app/org.DolphinEmu.dolphin-emu/data/dolphin-emu"
I can not find Dolphin in my mac support applications. How can I access the textures folder? How can I upload custom textures here? All textures must be within a folder that contains the Game ID of the game you are installing the pack for or the region free 3-letter equivalent. Usually the texture pack maintainer will distribute the pack using the proper Game ID. If the entire Game ID is used, it will limit the pack to that region. If the textures are not in a folder that is named properly, then the pack will not work! To check the ID of your disc image, right click the game in the Dolphin browser, click Properties, open the Info tab, and the ID will be listed next to "Game ID". 1.) Verify that the main texture pack folder is named to the proper Game ID or the first 3 letters. 4.) Enter Graphics > Advanced tab > Check Load Custom Textures. Prefetch Custom Textures - Caches textures in RAM when game is loaded. May reduce stuttering. Found on Graphics\Advanced tab. Note: If the texture pack does not appear to be "working", it could be that you need to increase the internal resolution! Higher resolutions require a more powerful system. Graphics > Enhancements tab > Internal Resolution. The rest of this post is geared towards texture pack creators, maintainers, or interested users. No need to read further if the goal is only to install texture packs. 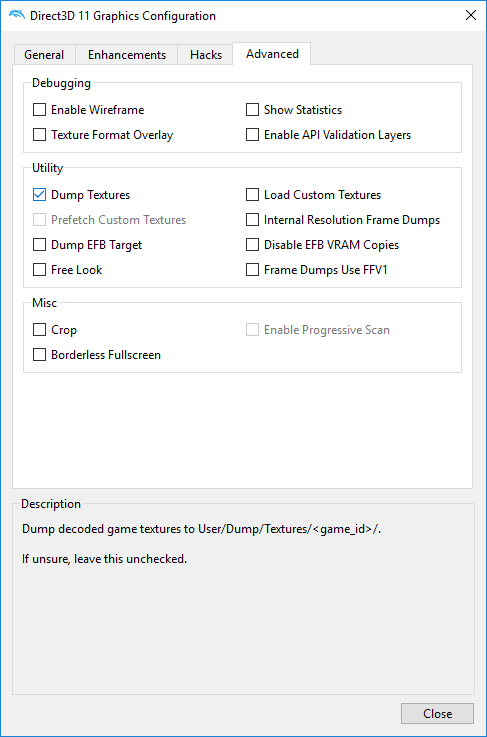 To dump textures with Dolphin, open the Graphics configuration, click on the Advanced tab, and check Dump Textures. When playing the game, dumped textures will show up in ..\Documents\Dolphin Emulator\Dump\Textures\<GameID>. Textures must be loaded in-game for them to dump. You can not dump the entire game in one go. Textures can not be dumped from the disc themselves, as the filenames will not match the hash needed by Dolphin. The only way to dump all textures is to play the entire game and experience all textures in-game. Now just to throw this out there, it's not entirely impossible to dump the files from the game disc and get the correct hashes. But it would require a LOT of effort, and the method of doing so would be different from game to game. You would need to find a way to extract the raw images from the disc which are most likely using propriety compression techniques, use xxhash to calculate the hashes of the raw images, and assemble a file name using the naming scheme that Dolphin uses (tex1_dimensions_hash_format.extension). By the time this is all accomplished, in the end it may have been easier to just play the game and dump the textures. A quick overview of a texture dumped by Dolphin. It will look something like this: tex1_256x256_m_efef240984783a47_14.png. • The header "tex1" means that this is the first revision of the new format. • Next is the dimensions, the dumped texture has the dimensions 256x256. • Next is the letter "m", which says this is a mipmap texture. • Next is the unique hash of the texture. • Last is a flag for the texture format. • No Game ID in the texture name. When converting a pack for another region, you only need to rename the GameID folder (or use the region free 3 letter equivalent). • Texture packs can have any number of sub-folders that contain textures within the GameID folder for better organization. • Textures can be dumped with ANY Texture Cache accuracy setting, and are are always compatible with every Texture Cache accuracy. • The dimensions of the original texture are now in the file name so there is a permanent reference for your custom texture. • Paletted textures once retextured, load up correctly everywhere in the game. (There are exceptions, see section on wildcards). • If a texture requires mipmaps, the dimensions will be followed with an "m" flag (Example: tex1_256x256_m_efef240984783a47_14.png). • If a texture has arbitrary mipmaps, then the texture will end with an "_arb" suffix (Example: tex1_128x32_m_acb0eea2ba61e548_2_arb.png). • The "_arb" suffix can be used on any custom texture to draw mipmaps at a fixed distance (see section on arbitrary mipmaps). To calculate the upscale factor of an existing custom texture, simply divide the custom width by the original width and the custom height by the original height. This is a valid integer scale of 9x. Textures should not be resized using a decimal scale. It will work in Dolphin, but abusing this will make your textures slower! The decimal value 2.34 is not an integer scale! Textures also should not have uneven scales. This throws off the aspect ratio of the texture. The dimensions have different upscale factors between them! Some textures dumped by Dolphin contain the mipmap (_m) flag, and are accompanied by smaller versions of the same image that contain a (_mip#) suffix. These are known as mipmap textures. Mipmaps are a collection of images all containing the same image but created at progressively smaller resolutions. Some textures require mipmaps to avoid "shimmering" in the distance. Mipmaps can also contain different images on lower levels to create unique effects. These are called arbitrary mipmaps and are covered more in the next section. Textures without the "m" flag should not be created with mipmaps. Dolphin will not make use of mipmaps if the game that the texture was dumped from did not make use of mipmaps for that texture. Dimensions for each Mipmap level should be half of the dimensions of the previous level, and should be created all the way down to 1x1. Each MipMap texture name must end with the level of the Mipmap that it represents. For example, level 1 should end with "_mip1, level 2 should end with "_mip2", level 3 should end with "_mip3", etc. Below is an example of properly creating mipmaps for a mipmap texture. The final mipmap should always have dimensions of 1x1. This holds true even if a dimension hits 1 before the other. In this case, continue to halve the larger dimension, and keep using 1 for the other. Starting with Dolphin 5.0-3506, DDS textures can have built-in mipmaps and do not require external mipmaps mentioned above. This means a DDS texture and all of its mipmaps can be built into a single file. PNG images can not have internal mipmaps, and will always need another image per mipmap layer. DDS internal mipmaps should only be created within mipmap "m" textures, otherwise it's a waste of resources as Dolphin will not make use of them. Manually creating mipmaps can be a pain. For windows users, my Custom Texture Tool PS can automate creating mipmaps. Arbitrary mipmaps contain images that differ from the base image/top level. The purpose of arbitrary mipmaps is to create effects that appear/disappear depending on how far the texture is away from the camera. The vast majority of games for the Gamecube and Wii do not use arbitrary mipmap effects, but there are a few that do. One of the greatest examples is the Super Mario Galaxy games which make heavy use of these effects. Textures that have these mipmap effects will dump with the "_arb" suffix under the condition that GPU Texture Decoding is disabled. If it is enabled, textures will not dump with the "_arb" suffix and it may be difficult to know which textures have these effects. Dolphin has the ability to draw these mipmap effects at a fixed distance at any Internal Resolution setting in order to see them the way they were "meant to be seen" by the game's developers, but again, GPU Texture Decoding must be disabled. 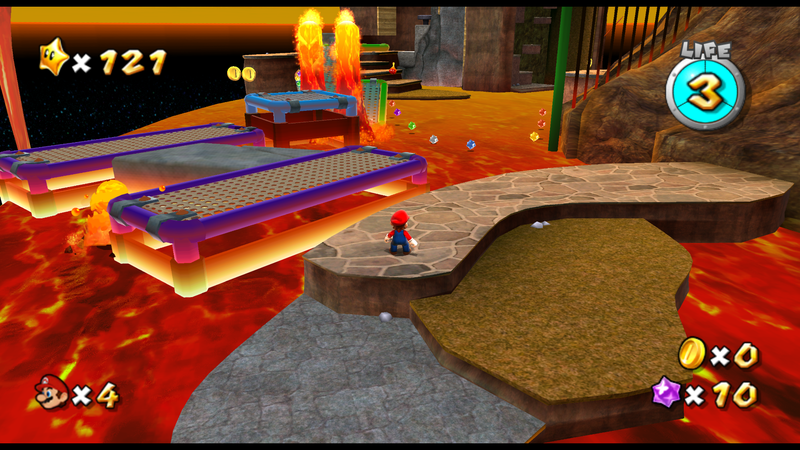 Below is an example of a lava texture that uses arbitrary mipmaps in Super Mario Galaxy, as dumped by Dolphin. And how it looks in-game can be seen here (with GPU Texture Decoding disabled). Starting with Dolphin 5.0-6197, custom textures can now make proper use of arbitrary mipmaps. Before custom texture mipmaps were drawn at a distance that was defined by the Internal Resolution and Anisotropic Filtering settings, making where they appear unpredictable. Now textures that include the "_arb" suffix, mipmaps will appear at a fixed distance so the artist has full control over where these effects appear. The "_arb" suffix can be added to any custom texture to draw mipmaps at a fixed distance, or it can be removed from textures that dump with the suffix to dynamically draw mipmaps depending on Internal Resolution and Anisotropic Filtering settings. It will be up to the artist or pack maintainer to decide when to use the "_arb" suffix. Not long after came Dolphin 5.0-6199. This update picks the same mipmap level for custom textures as it would the game's stock textures, meaning it's possible to perfectly line up custom texture effects with the game's stock effects. This also allows for much higher resolution mipmaps. For the best results, the texture's upscaling factor should match the target Internal Resolution setting. Meaning, a 128x128 texture, upscaled by 4x, resulting in a 512x512 texture, will look best at 4x Internal Resolution. A secret feature has been available for years that allows using a wildcard character if the same texture dumps with multiple hashes. Unfortunately, this character (*) was invalid for filenames in Windows. Starting with Dolphin 5.0-8619 the wildcard character has been changed to ($) so Windows users can take advantage of this feature. Sometimes paletted textures will dump multiple times when the tlut hash changes. While this is not a common issue (in fact it is very rare), it can happen. Games that are known to be affected are The Legend of Zelda: Twilight Princess (Wii) and Wind Waker (GC). Without the wildcard, every instance of this dump would need to be found in order to have it retextured all the time. This is a nearly impossible feat that wastes a lot of time dumping and ultimately precious disk space. So using the example above, a "$" can be used as the second hash which will effectively retexture every instance. There is a lot to this format, so I'm only going to cover some basic information that pertains to creating DDS textures for Dolphin. I have linked a few articles at the bottom of this section that goes much further into detail than I will here. DDS textures have the advantage that they are faster than PNG textures. DDS can completely avoid or greatly reduce stuttering that custom textures may introduce. The situation for PNG textures is improved with the option Prefetch Custom Textures, but DDS will still outperform PNG because they are decoded much faster on the GPU. The disadvantage of DDS textures is that they are compressed with a lossy algorithm, meaning, the overall quality of the image is reduced when converting to DDS. The quality hit can be avoided using uncompressed DDS textures, but they are much larger in file size and require the same amount of VRAM as PNG. This makes them ideal for UI elements, but not so much for environments and other large textures. Uncompressed DDS textures do however still have a speed advantage over PNG. • Dolphin currently supports four types of DDS block compression: BC1 (DXT1), BC2 (DXT3), BC3 (DXT5), and BC7. • It also supports uncompressed DDS textures: DX9 ARGB, DX10 RGBA, or DX10 BGRA. Ishiiruka can not use DX10 RGBA, Red/Blue will be reversed. • DXT1 textures are half the size of DXT5/BC7, and are faster than most other formats. Not recommended for images with transparency. • DXT3 should not normally be used as it is the same size as DXT5, only supports 4-bit alpha, and can create noticeable banding. • DXT5 textures may yield higher quality than DXT1 textures. This is the format that should be used for images with alpha (if not converting to BC7). • BC7 offers much higher quality than most other formats, is equal in size to DXT5, and has the same VRAM requirements. Requires a DX11 capable GPU. • Uncompressed provides lossless quality, but are 4x the size of DXT5/BC7 and require 4x the VRAM. These should only be used for smaller textures (like UI/HUD elements). • DDS textures can have built-in internal mipmaps. These are supported starting with Dolphin 5.0-3506. • I personally suggest creating packs using BC7 and uncompressed textures going forward. My custom texture tool can aid in converting packs using these formats. Starting with Dolphin v4.0-5234, there is a built-in converter to convert custom textures from the old format to the new format! This has since been removed from the master branch, but you can still use Dolphin 5.0 to convert to the new format. • Navigate to C:\Users\UserName\Documents\Dolphin Emulator\Config. • Open the configuration file GFX.ini with a text editor. • Find the setting ConvertHiresTextures and set the value from False to True. • Now just play the game. When Dolphin loads a custom texture it will automatically rename it. • If a duplicate paletted texture is found while playing, it will be automatically deleted. • The texture converter will rename any mipmap files that are found if the base texture (top layer) is found. • If multiple textures are found that share a duplicate ID, then they will be appended with an incrementing integer. • Dolphin 4.0-5234 - Introduction of the the latest texture format. • Dolphin 4.0-8583 - Support 3-digit GameIDs for custom texture folder. • Dolphin 5.0-3506 - Natively support DDS textures and internal mipmaps. • Dolphin 5.0-4894 - Support for loading DDS BC7 custom textures. • Dolphin 5.0-6197 - Treat custom textures with "_arb" suffix as having arbitrary mipmaps. • Dolphin 5.0-6199 - Apply custom texture scale for arbitrary mipmaps. • Dolphin 5.0-6208 - Remove support for old custom texture format. • Dolphin 5.0-7631 - Replace usage of SOIL with libpng. • Dolphin 5.0-8598 - Use simplified libpng PNG reading (fixes PNG transparency bugs since 5.0-7631). • Dolphin 5.0-8606 - Fix critical buffer overflow in LoadPNG (fixes crash since 5.0-8598). • Dolphin 5.0-8619 - Change wildcard to Windows compatible character. • Dolphin 5.0-9217 - Implement resource packs (an alternative to texture packs). • Dolphin 5.0-9558 - Support compressed resource packs. This is a PowerShell script that can help identify issues and fix textures in your pack! It can detect bad aspect ratios, improper scaling factors, generate mipmap textures, convert textures between PNG, DDS, and JPG formats, and even fix some textures with bad scaling factors! It requires ImageMagick to function, as Windows cannot read dimensions and write images in batch without an external program. If you want to know more then click on the title above. As you rename textures with Dolphin from the old format to the new, this handy tool by StepDragon can watch for which textures get renamed, and search for and rename any files you have (PSD, XCF, TXT, etc..) that share that texture's name. For example, if texture GAMEID_12345678_0.png gets renamed to tex1_32x32_abcdef0987654321_0.png, then GAMEID_12345678_0.psd will also be renamed to tex1_32x32_abcdef0987654321_0.psd. I am also including an HD remake of the Gamecube fonts that are now included with Dolphin, so any game that uses these fonts will load this texture. • These fonts will NOT work if IPL.bin is present in Dolphins GC\<Region> folder. • There may be alignment issues with some games that may need to be manually fixed for a specific target internal resolution. • Anyone is free to use it in their texture packs or do anything they want with it. If Dolphin is setup to be portable, can the textures be housed within the Dolphin emu folder, or it required to place the files within the global Dolphin directory? (04-16-2019, 05:34 PM)deejus679 Wrote: If Dolphin is setup to be portable, can the textures be housed within the Dolphin emu folder, or it required to place the files within the global Dolphin directory? If Dolphin is set up to be portable, you have to place the textures in the portable user folder, not the global folder. (04-16-2019, 06:41 PM)JosJuice Wrote: If Dolphin is set up to be portable, you have to place the textures in the portable user folder, not the global folder.